Given a supportive cash flow, most of us would buy all organic, all the time. Organic foods taste better and are free of the harmful pesticides and synthetic fertilizers that are used in conventional farming. In addition, organic foods are not irradiated to kill micro-organisms (bacteria, fungi, etc. ), and generally are not bio-engineered or genetically modified. Unfortunately, most of us do have limited budgets and we also know that organic foods typically cost more than conventional. Each year the Environmental Working Group (EWG) publishes their list of the most important fruits and veggies to buy organic because the conventional produce is most often contaminated with chemical pesticides & fertilizers. They also publish a list of the produce that is most often free of these potentially harmful chemicals. Here are their very helpful lists which can, at least, reduce our chemical exposure through food: Apples, Celery, Cherry Tomatoes, Cucumber, Grapes, Imported Nectarines, Hot Peppers, Spinach, Peaches, Potatoes, Strawberries, Kale/Collards, Summer Squash/Zucchini, Sweet Bell Peppers. Why does it matter? According to Rodale News, “That’s because emerging research is finding that pesticide exposure—even in tiny amounts—can mess with the way our genes function throughout our lives and is linked to a range of ailments, from certain cancers to diabetes and obesity. Just this week, researchers found a link between pesticides in food and ADHD in children.” In addition, remember that our chemical exposure is cumulative. Instead of being exposed in just one product, we’re exposed through the hundreds of products we consume or use each day. Buying locally grown fruits & vegetables can also reduce our chemical exposure as many local farms do not use the big gun commercial chemical pesticides and fertilizers. If you’re not sure, ask when shopping at your local farmer’s market. In the Charleston area, Ambrose Farms, Joseph Fields Farm on Johns Island, and Thornhill Farm are 3 local organic farms. Another great Charleston area fresh local source is the Vegetable Bin downtown on East Bay St., and it is very affordable. 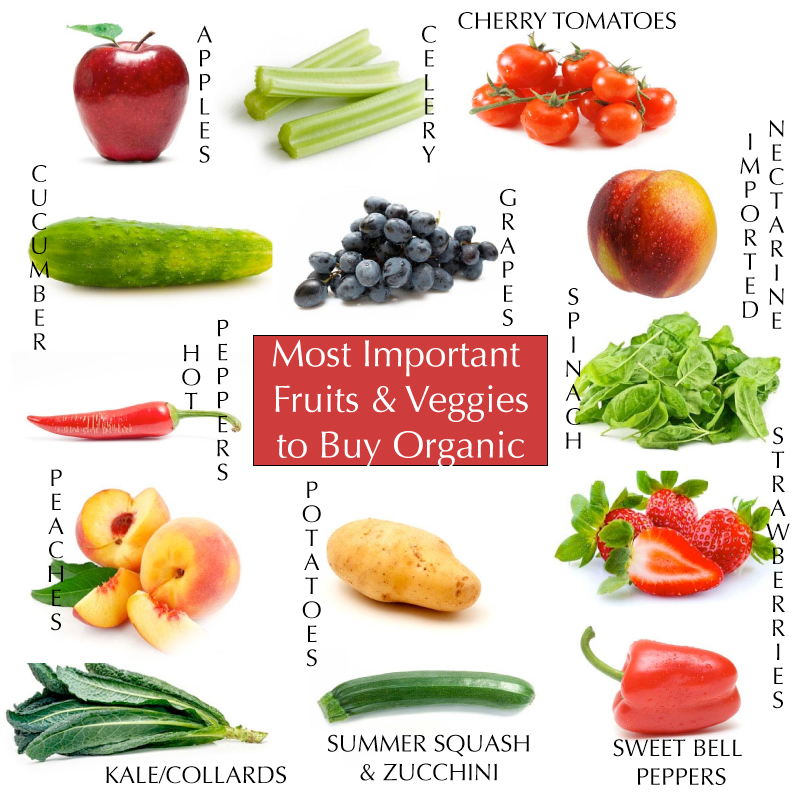 Buying these 14 organic fruits & veggies is a great place to start reducing our harmful chemical exposure. Remember OWL: Organic, Whole (not processed), & Local.